Hello from rainy, Virginia! This week I'm visiting my cousins and helping one of them nurse a recent surgery. Getting us through this downpour and the chill in the air? Jack Ryan and getting alerts from Nordstrom that my beauty packages have finally arrived at my home in Seattle. As you guys know, my favorite lists to make for my blog are the ones about beauty. I'm excited to share these ones with you because 95% are cruelty-free and excellent for Fall. Shall we begin? one // Miami Medium Zip Closure Cosmetics Case (Mink) - I love how transparent bags are back in style. This one is particularly cute and can double as a sporting event bag! It comes in 4 colors and is water-resistant. A plus, if you're going pool side or keep it in the bathroom. I like multifunctional and purpose to purchases and this gal pal fits the bill. 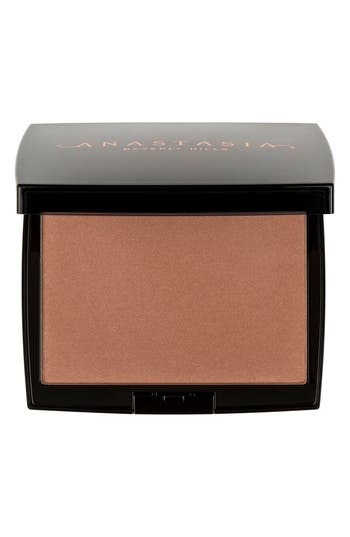 two // Anastasia Beverly Hills Powder Bronzer (Rich Amber) - I've been using this bronzer all summer. 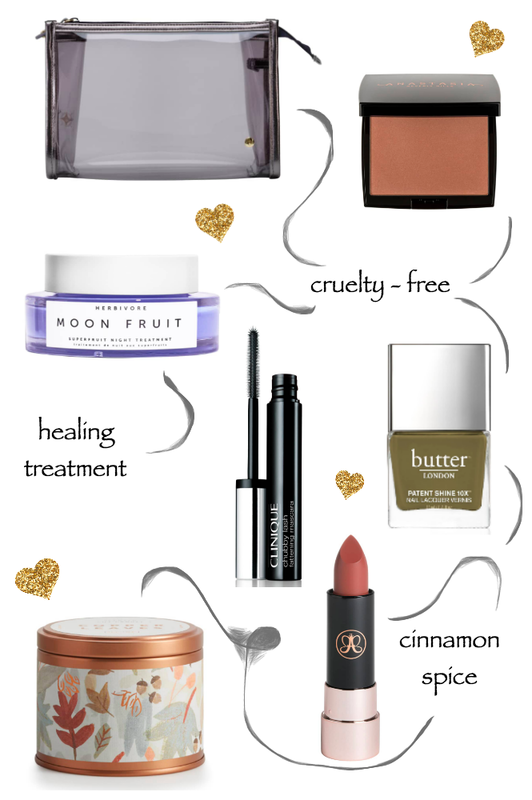 It's not only cruelty-free but also vegan. The Rich Amber is beautiful. I tried multiple shades but I knew this color would carry me throughout the year. However, be stingy! It's highly pigmented and you can over do it with the stroke of a brush. 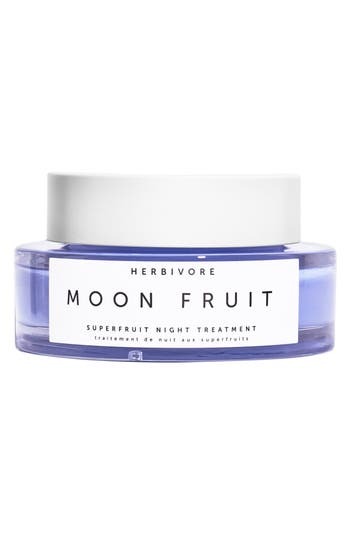 three // Herbivore Botanicals Moon Fruit Superfruit Night Treatment - I'm not swapping out my everyday moisturizer from my favorite cruelty-free facial products. I'm still using it in the mornings (mixed with my foundation) but I am replacing my nightly routine with this new moisturizer. Herbivore products are all cruelty-free and vegan. They are well known for their skincare and this Night Treatment is packed with nutrients and antioxidants. You only need a little and that it firms up once it's been put on. Almost like you're wearing a mask but you keep it on all night. Pro-tip: both Nordstrom and Sephora will give you up to three samples in store if you ask. I tested this night cream before buying it. I also purchased online because they're giving a free gift with purchase. four // Clinique Chubby Lash Fattening Mascara (Jet Black) - This is the only product that isn't cruelty-free but Clinique is known for their extensive allergy testing of their products. This makes their mascaras perfect for those with sensitive eyes, like yours truly. I wear this product everyday and try to stock up during Mascara Madness. five // Butter London 'Patent Shine 10X' Nail Lacquer (British Khaki) - Can we talk about this color?? This polish is chip resistant, cruelty-free and vegan. It's also gluten-free but I'm not sure why that would matter cause, please, don't eat it. What I love about this brand is that there are only 8 ingredients. Yes, it costs a bit more but they also strengthen and prevent nail breakage. Win/Win. 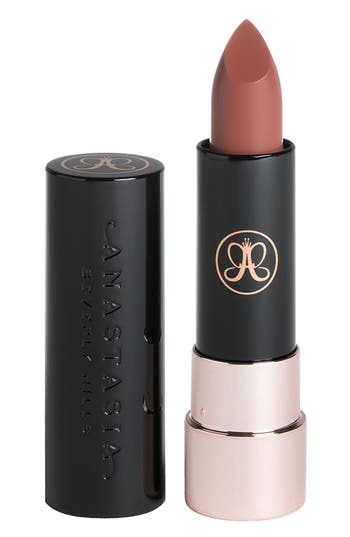 six // Anastasia Beverly Hills Matte Lipstick (Spice) - If you read about the bronzer, well, this lipstick is the same brand. I just bought this color and when I say I'm in love... I'm in love. As you all know, my favorite lipstick is the Tarte rainforest of the sea collection and I've worn Sunkissed since last April but this lip will carry me through winter. Spice, is where it's at! seven // Illume Scented Candle Tin (Copper Leaves) - Described as: Woody and aromatic, with notes of chestnut and cinnamon. This is Fall in a candle. Literally the smell of Autumn, spiced mulled wine and delight. 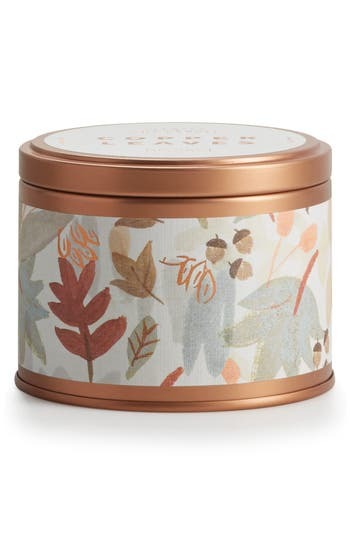 The print will warm your home, as well as the copper tin with lid. It also comes in Rustic Pumpkin and Cider Woods . There's a ceramic version that's absolutely darling.